A friend of mine on Instagram recently asked me about my art rituals. The things I do to get into the frame of mind to work. I decided to write a blog post about it, since it couldn’t easily be put into a list. And being obsessive compulsive, I had to get it right. Working at a studio 45 minutes from my home (although I have a second studio in my basement- another story-another set of rituals) I live in a culturally different place from the tattoo/piercing and cannabis servicing places – the little section of town where my “in town” studio is located. This space is in an old school house, built in the very early 1900s. I have an entire classroom to myself. I have painted the floors white to match the walls. To get to my studio, I switch my thinking over to work. I take the backroads, never the freeway. When I get there, I open the door, take the dehumidifier down the hall to empty it, since I have no running water, turn off the fume eliminator, and take my jewelry off. I place rings around my watchband, fasten it and put bracelets in a formica tan/brown patchwork salad bowl on my long table. This is the table where I sit to contemplate the work I am doing at the time. The work is always about 15 feet in front of the table, on an easel. There is a row of waist high big tables beside the easel, upon which I put the paints, glass palette for working in oil paint, many containers of acrylic paints, assorted meat trays and yogurt containers for mixing the acrylic paints with plastic spoons. 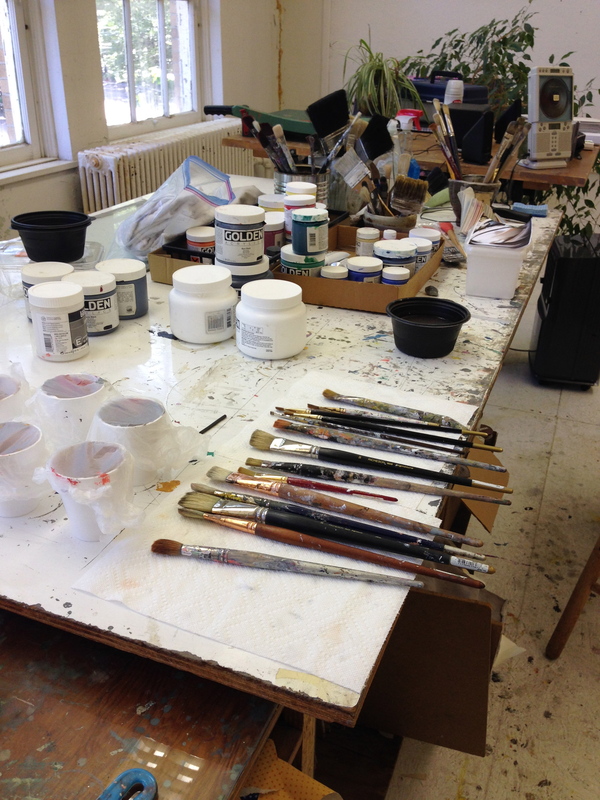 There are mediums and brushes and a huge plastic bucket for water, which I keep on the floor. I have to go down the hall to fill this, if I am working in water based paints that day. I always stand to paint. I never use a stool or table. I believe that I am a channel for the work I do. I believe it does not come from me, but from something outside myself. Therefore, to achieve entry into this parallel universe, I put on some music made by someone who also believes a “zone” has to be reached in order to do good work. The music has to be loud. Then I start mixing. I start painting. Moving back and forth to and away from the canvas. Pausing, usually, only for a lunch I have made and placed in the refrigerator next to the microwave. Always with a Diet Coke. Sometimes I will sit at the long table and spend time looking. Sometimes I can look for an hour. Sometimes, I get up suddenly and paint a piece of paper and place it temporarily over an area in the painting, before I commit to painting that color on the canvas. Most of the time, I glue the magazine pieces on the canvas as if they are paint, sometimes painting over them, sometimes leaving them alone. Squeegy-ing the glue out from under the magazine paper with a small triangle. And wiping the remainder off with a baby wipe. Wrestling. The distillation of good and evil. There is a good guy and a bad guy. I have a good friend who is a wrestler. I went to one of his matches the other night and I was totally engrossed. Rolls of unravelling toilet paper and crepe paper tossed into the ring. Neon mohawks, tattoos, boos and hisses. Large blubbery thumps and noisy crashes. Flips and other acrobatics. Primitive, you say? It was wonderful. Good and bad. Not so in real life? My new discovery is, that, even as the managers in the wrestling company do not enter the ring without knowing how to take a fall, the same is true with life. After years of seeing the character flaws in people and sorting through the many nuances, I have come to this conclusion: You are either good or bad. Take a look at what I consider good. My doctor changes out of his Halloween costume during a crazy party and even though it is in the middle of the night, he makes an emergency house call. Good. The friend next door listens to my woes, hearing me tell the same story again and again. Good. The fellow artist shares her own techniques, gallery contacts and juried show opportunities. Good. The person at the grocery store when my green bean bag breaks. This good person hurries away to the produce section at the back of the store and selects new green beans, clumps at a time. For me! Good. Ok, you say, where is the bad? And, by the way, I am the one in the ring here, I am only talking about myself and my experiences. I take the falls. I fall against the ropes. These people could be doing nice things for others. But I doubt it. Here we go: The person says good things to me, bad things about me to someone else. Bad. The person lies to me. Bad. One enters my studio, goes through my things, snoops around without my permission. Oh and steals my Booker T. and the MGs disc from my CD player! Bad. You are getting it. One more. A person cheats me in a business deal. Bad. Oh, I used to say, the person is from that type of culture. (Could be this culture. )… That is part of the game. Nope. Not anymore. Bad. Bad. Bad. Back to wrestling. I go around now, doing the things that cause me to occasionally interact with people and I think of wrestling. No one is passing out rolls of toilet paper for me to stream at the good people.Thank God. And I don’t get the urge to throw a pie in a person’s face here and there. Thank God, again. But, good and bad. It keeps things simple. Hoarding. I think of hoarders as people with stuff forming a landslide in their homes. Until we had our basement finished. And we designated a certain part of the finished basement to be unfinished. That was when I thought of our family as hoarders. We did a lot of purging and sorting. To attempt to revamp the hoarder self image. Our house is immaculate. Each room, people go into, saying, “What a nice room to read a book in!” Very sparse. I have a thing about neatness and cleanliness. You can tell. But to read a book? I spend a lot of time maintaining the neatness. We hoard. Not only music, but Fiesta dishes. Many different kinds of china. And crystal serving dishes. Clothes. Dolls. Little porcelain shoes, also in boxes like the dolls. Bordering on hoarding. The music on vinyl has gone into decorative crates in the finished part of the basement. The CDs in shelving in the unfinished part. However, we too have that cliched hoarders characteristic. When we wanted to find something like the wire that hooks the computer to the printer, we had to sort through a box labels “wires”, and delving into the assortment of extension cords, picture wires and Christmas light blinkers was a journey unto itself. I am an artist. I do not assume this photograph to be a work of art. I was in a store yesterday. And my daughter was in the dressing room. I decided to take a seat outside the dressing rooms on a platform. Couldn’t even be called a bench. A dressing room with an “Out Of Order “ sign on it?? I thought about it as my daughter was changing her clothes. Well, it could be, that if one were to open the door, disregarding the sign, that there was an elevator shaft on the other side of the door and one would plummet to one’s death. After all, what could be “Out of Order?” Could it be flickering flourescent lights reminiscent of a David Lynch movie? So minor. Had to be something more dangerous like a mine shaft. On the other side of that door. I wonder if this “Out Of Order” sign means the end of the world is on everyone’s mind? Or another phrase put up there with no thought whatsoever. After all, they put “Out Of Order” signs on bathroom stalls, don’t they? Ceres Gallery is having a group show. In June. The exact date of the reception is June 26, 6-8 PM. It is a Thursday. The gallery is located in Chelsea, an established gallery section of New York. 547 West 27th Street. New York, NY 10001. Phone: 212 947 6100. The second floor. You can take the stairs, if you prefer. I did the piece for this group show and am pleased with it. It is based on a painting I did a few years back. The painting had collage in it and the abstraction was based on the spaces in between trees. In the painting, I chose the pieces from magazines, not for their subject matter, but for their potential for volume and how they related to the paint. The charcoal translation is interesting (bad word, interesting) to me, since the face from the painting comes through as significant here, where in the very large painting, it was just a shape. I hope some of you can attend my reception! It would be so nice to see you! We had an ice storm here in Atlanta this past winter. Not a nice storm. Put the separation between the words in the right place. Ice storm. You know the one. We, in Atlanta, looked like fools on TV and the internet. The storm I am writing about (We actually had two.) started out as a snow storm. Just like any other. But the traffic! Lord, the traffic! And the slipping and sliding! A person lost his life. A baby was born. It took the average person to move at the rate of one eighth of a mile per hour. If that. Yes, there was heroism. We Americans always go for that when reporting such horrors. My husband was in his car along with the rest of Atlantans, arriving at his intended destination. He had to turn around because the person he was dropping off at the bus….well, the buses were not running. It took him an hour to turn around and he got home at midnight. He had been driving for twelve hours. To go ten miles. To the bus and home. Ten miles roundtrip. Because people were frustrated in the crazy traffic, a lot of people left their cars and walked that night. The next day, cars were strewn all over expressways and backroads, abandoned like discarded toys on Christmas Day. It looked like The Rapture or a science fiction movie. No, my husband did not spend the night in the shelter of a grocery store, using feminine products as a pillow. No, he did not experience the terror of being disconnected from our child because he had no idea if she was at the school or not. No, he did not spend the night in his car with no one knowing, due to a drained charge in his cell. I am about to tell you I have broken my planking record at the gym. I know I told you this before, that I could do “the plank” by visualizing being underwater, thus being nicknamed “The Scuba Planker!” And I was at two minutes then. As The Scuba Planker. Now I can hold that position for six minutes! And I do not have to visualize being underwater anymore. I expect to walk into the gym one day and I’ll see a plaque on the wall. or worse yet, as I extend my time, I wonder if there will be a Plank Off. Like a Bake Off. Or a Pie Eating Contest. I will be matched with someone and together side by side we will be tested to determine who can hold the plank the longest. I have to send an image to Ceres Gallery. It is to represent the work I am showing in the solo show for the brochure. I hate to commit. The show is many months in front of me. And I may still be working on the pieces until they are sent to the photographer. After the photographs are made, it feels permanent. Website, my print books, future reference. I remember one of my solo shows here in Atlanta, where I put a tube of cadmium yellow light in my purse. Then upon entering the gallery, where my work had been hung, I walked over to the one of my paintings I felt needing a touch up and I dabbed the paint on with my finger. Cameras and all. In fact, there were a few wet oil paintings in the show for about two weeks. Until they dried. All because I worked on them, up until the last minute. Sending in an image (not this one) feels so permanent. But it will have to do. Calling those 1 800 numbers to get a credit card balance from a store can be a debilitating experience. I called the J.Jill Store the other day, asking them to send me an official plastic credit card. So as not to carry around the frayed, dog-eared business card with my card number on it. I do carry around this battered card and make purchases, but I thought it nice to have a real credit card. The kind that other people carry around. That’s it. That is all I wanted. And the only way to get this was to call the number. What I heard from the Customer Service (?) Representative on the other end was… oh, and I have to say, that getting to this person was a half hour ordeal. (To digress further, one time I was talking into one of those automated phone “service” devices and I slurped my almost empty Green Tea Frappacino and the recording immediately went into Spanish.) Therefore, you see how well the automated system works. Back to the Customer Service Representative. She said something to the effect that since I was a valued customer, I was entitled to a special offer. I kind of got excited about this, thinking that maybe I was entitled to some deeply discounted clothing in their Spring Line. But what do you expect from someone who roboticly asks you, “Is there anything else I can help you with?” after you tell them you are hanging up on them? The offer: By paying a few dollars a month on my bill, if I should become infirmed, lose my job or pass away, I will not be liable for any unpaid charges on my J.Jill card. For peace of mind, she said. I said I would get peace of mind if I wasn’t talking to her. But that’s my peace of mind. Her point of view: J.Jill is always with me. Even facing an oncoming truck!